Florida lifestyle, decorating, and retirement are topics covered by Virginia, who shares her own experiences. Inspired by Sabrina Soto's program on HGTV, I want to make over a bedroom using her budget tips. On the show, she interviews the homeowners about the look they want for their room. She then assembles all the furniture and accessories to create their dream room. What they see is a very expensive, high-end designer room. They love it, but can't afford it. 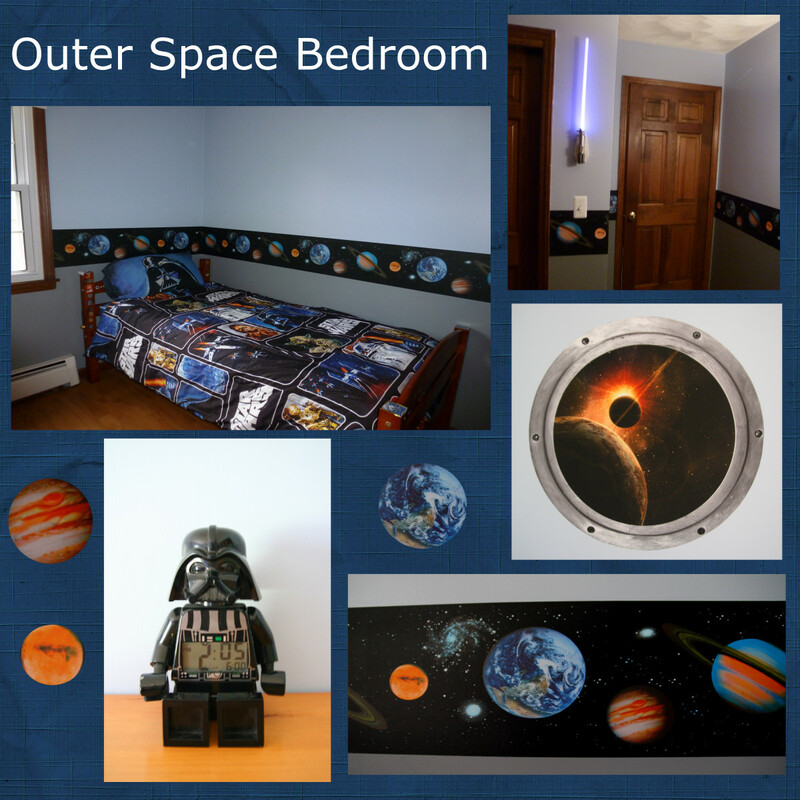 She then recreates the room for them using budget furnishings to get the same look for a budget price. Just imagine, getting a $28,000 bedroom for just $2,800. With savvy shopping and do-it-yourself, Sabrina performs this miracle. Let's try out some of her tips here. 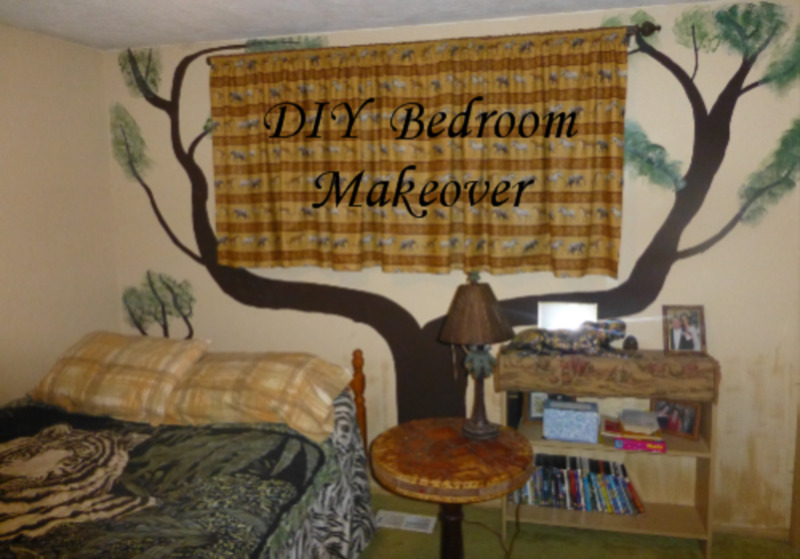 I hope you'll find some inspiration here to apply to your own bedroom makeover. I first spotted Sabrina Soto hosting the HGTV series Get It Sold. She did quick makeovers to help homeowners sell their homes. I loved the staging she did to transform each house. Before that she hosted shows on TLC and on MTV. Her background in real estate and interior design comes together in her HGTV programs. Here's a quickie video showing tidbits from her television career. I'm visualizing a room with soothing colors such as pure whites and the aqua colors that will make me think of the ocean and white sand beaches. I'd like something unusual for a headboard that will give an architectural feel or serve as a strong graphic element in the room. Since I love to read, I'd like a comfortable seating area in the bedroom with cushy pillows. I took this photo in one of the model homes in Solivita, a retirement community in Central Florida. Here's what I like about this room and why it has a luxurious feel to it. The soft teal color in the pillows give that beachy feeling in contrast to the white coverlet. The stitching in the coverlet reminds me of patterns left in sugar-fine sand by retreating wavelets as the tide goes out. 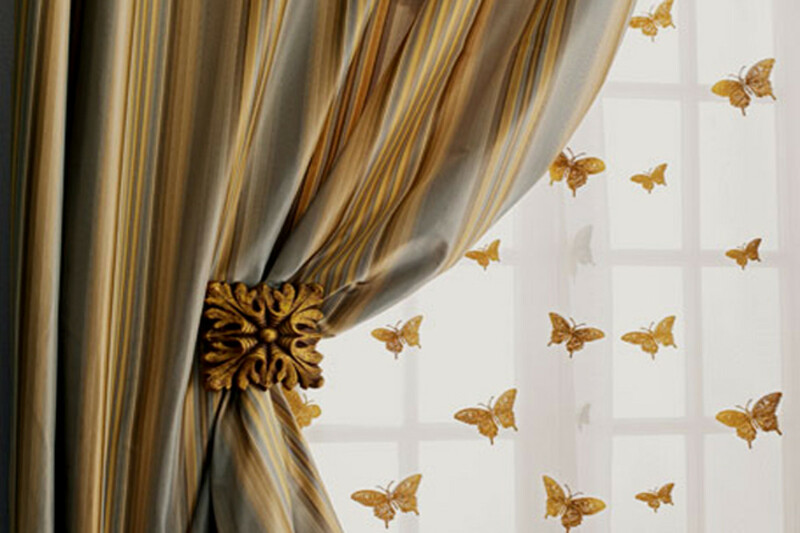 The curtains bring a different shade of blue like the variations of water color in the ocean. The light colored walls make the one-of-a-kind headboard stand out serving a dual purpose of anchoring the bed and dressing up the wall with a piece of art. The lampshade, draped with organza tied in a bow, adds a finishing touch. Watch Sabrina Soto Transform a Room - I love her style! Sabrina Soto gets quite creative in matching the expensive designer elements in the inspiration room. One thing she looks at is the size, shape and feel of the replacement piece. It isn't always an exact match, but gives the same balance and general look to the room. Here is a table lamp with a burlap shade. It's reasonably close to the silhouette and size of the one in the big photo above. Now work your magic on it by adding a big, organza bow to it. In her show, Sabrina often says "I found this online." Now she isn't specific, but she could be shopping online sites like Target or Walmart which are considerably cheaper than buying at furniture showrooms. Quite likely she checks Amazon which has a huge selection. 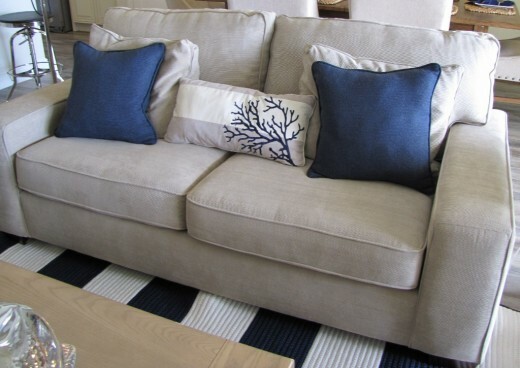 Here's the loveseat similar to the one in my inspiration room. It's covered in linen. With a plain pillow like this, you can use paints to add a design of coral. What a bargain, when you compare it to designer pillows that you can purchase. Are You an HGTV Fan? Check eBay for items wanted for the room. 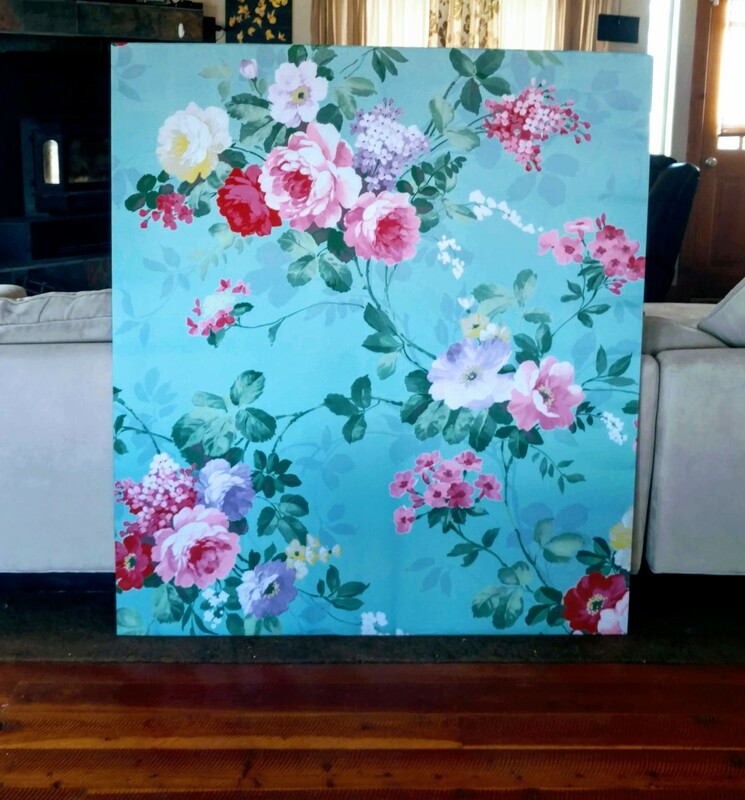 Shop the local thrift store and yard sales looking for pieces to refresh or make-over for the room. Try making things yourself or finding a local craftsperson. 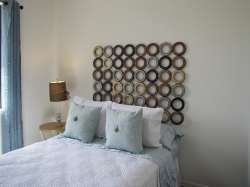 For instance the headboard here could be made from metal rings welded together. If you see what you want, take a photo of it to use as an example. 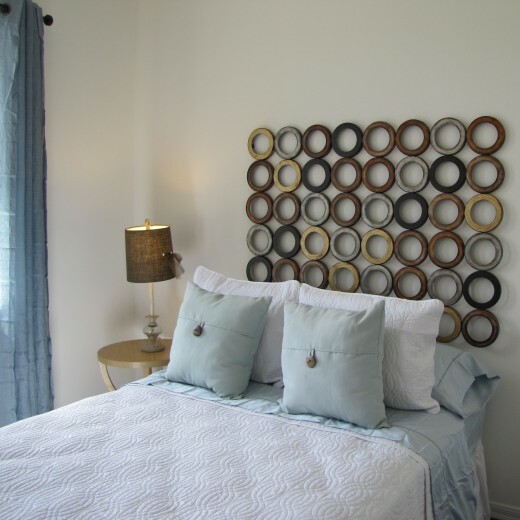 Another way to create the wooden rings (substituted for a headboard in the inspiration room) would be to use embroidery hoops and paint them yourself to get the varied look wanted. In the photo of the designer room, it shows an area rug in blue and white stripes. Most of it is under the sofa, so I think you could get the look you want with this less expensive indoor/outdoor rug. Would You Like to Give Your Bedroom a Makeover? - Or Another Room? I do shop in eBay once in a while as I like vintage but I stopped as I want to declutter and stay with a few pieces. I do watch the HGTV shows once in while. I enjoy it. I love what pretty cushions and lamps do, relatively cheaply, to lift the look of the bedroom! Nice lens! I don't redecorate very often but there are some really nice ideas here. @ecogranny: I just assumed everyone knew of that TV channel. Guess I should clarify. I'm going to have to Google HGTV (blushing). I've not heard of it until now. I do like that pretty bedroom, though, and surprised at our similar taste. We've been wanting a headboard solution for ours. The example has given me some new ideas. Thank you so much!